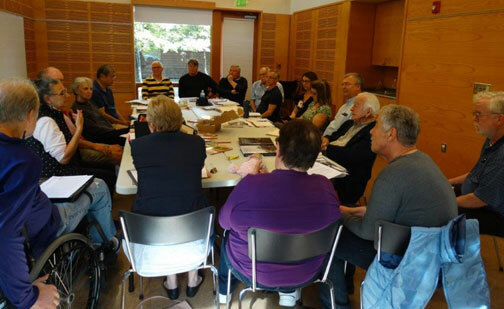 Photo courtesy of Monica Wooton: The team working on the Magnolia Historical Society’s third history book meets on Sunday, Sept. 23. The Magnolia Historical Society is diving into the 1950s and ‘60s for its next book. This is the historical society’s third book, as the organization works through the decades to document and preserve Magnolia’s past. “Magnolia: Memories and Milestones” received the Virginia Marie Folkins Award from the Association of King County Historical Organizations in 2000 for best history book written in King County. Longtime residents shared their memories, and milestones, such the creation of Discovery Park and the Magnolia Bridge, were included in this first book. “Magnolia: Making More Memories” narrowed the focus to the decades of 1920-1940, again with people’s stories, a lot of research and archival photos. There are nearly 50 Magnolia residents collaborating with the historical society for the third book, which project manager Monica Wooton says focuses on two very distinct and interesting decades. “There’s just unabridged enthusiasm for this book,” she said. The book team came together on Sept. 23 to share first drafts of their contributions. “It’s an enormous undertaking — every writer gets a packet,” Wooton said, which lays out story ideas, writing guidelines and assignment deadlines. The Magnolia Historical Society’s efforts are being bolstered by an $80,000 Seattle Department of Neighborhoods grant the organization received in DON’s June funding round, Wooton said, which is on top of the $17,000 MHS raised in the community, Wooton said. Reflecting on what Magnolia was in the 1940s and ‘50s also means recognizing what it’s lost. It was a time when the neighborhood had its own bowling alley and movie theater. Schools were filling up, and kids played in the streets unsupervised, Wooton said. “Everyone’s pretty nostalgic about that stuff going away,” she said. People returned to Magnolia from World War in the 1950s, and families started growing in the neighborhood, as did the schools. It was the decade when many of the churches people see in Magnolia today first formed. The television became a bigger part of people’s lives in the 1960s, and broadcast to the world the civil rights movement, Woodstock, the Cold War, World’s Fair and the Vietnam War. “We’re doing a chapter on Vietnam by someone who went there,” Wooton said. The historical society expects to bring on paid positions for the project as it nears completion, including a designer, indexer and printer. Wooton said a content editor could be brought on within the next two months. As the neighborhood grows and changes, Wooton said, these history books will only become a more important resource. People just need to know where to look. “We have a whole group of people who don’t know these books exist,” she said.